You can now have the opportunity to see what it was like to dine aboard the Titanic during a special holiday dinner. 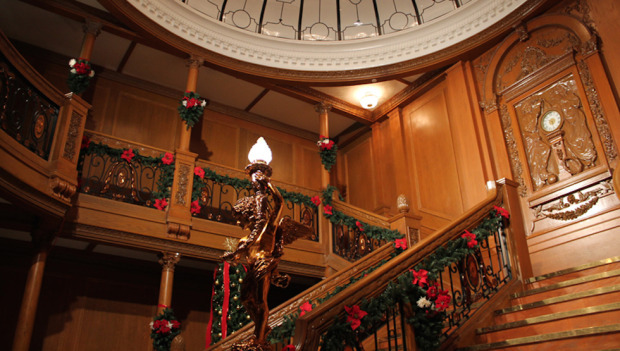 Titanic: The Artifact Exhibition decks its halls for a series of special Edwardian-themed dinners during the holidays. These limited-time engagements offer visitors the chance to step back in time to the 1900s to spend time with some of Titanic’s most notable passengers as they share stories and holiday traditions. Along with a “first-class” feast, attendees will enjoy the sounds of carolers and a VIP tour of the Experience adorned in holiday décor. Pricing is $130 for two tickets and includes two, three-course dinners, special guided tour of the Experience, two audio guides, holiday ornament and commemorative photo. Dinner service begins promptly at 6:30 p.m. on Dec. 6, 12, 13, 19, 20, 22, 26, 27. The meal begins with a salad sprinkled with cranberries, mandarin oranges and cranberry vinaigrette, followed by chicken with caper cream sauce, smoked ham with holiday glaze, rosemary roasted red potatoes and seasonal vegetables. Gingerbread with white chocolate mousse and a champagne toast complete the meal. For more information about Titanic: The Artifact Exhibition or to reserve tickets, visit PremierExhibitions.com.